McCarthy could well become the next speaker if Republicans retain control of the House this year. So there’s a fair amount riding on national TV interviews like this one, and the congressman did not miss the chance to pitch viewers on the benefits of GOP rule. McCarthy ran through a list of what he considered President Trump’s accomplishments, such as cutting taxes and regulations, but things veered off-course when he mentioned the labor force participation rate. Let’s dig in. The labor force participation rate, a monthly statistic, measures the percentage of the U.S. population that was employed or looking for a job. It factors in only noninstitutionalized civilians ages 16 and older. At the end of January 2017, the labor force participation rate was 62.9 percent, according to Bureau of Labor Statistics data. President Barack Obama’s term concluded on Jan. 20, 2017. At the end of March 2018, the rate was also 62.9 percent. It was not “going back up to more people in the workforce,” as McCarthy said during his interview. “The civilian labor force grew from 159.7 million in January 2017 to 161.8 million in March 2018, so just over 2 million,” said Erin Perrine, a spokeswoman for McCarthy. That makes the second part of McCarthy’s statement accurate (“more people in the workforce”), but it doesn’t address the labor force participation rate, which measures something different (the percentage of the workforce that had a job or was looking for one in a given month, not total employment). Perrine is using a slightly lower baseline for Obama (62.7 percent) from the end of December 2016. But Obama also governed for 19½ days in January 2017, so it’s fair to give him some, if not most, of the credit for the uptick to 62.9 percent at the end of that month. On “Mornings With Maria,” McCarthy mentioned the labor force participation rate as part of his argument that things were getting better under Trump. But presidents and the bills they sign have only so much influence on the labor force participation rate. The rate peaked most recently at 67.3 percent in April 2000 and has been declining steadily for the better part of the past two decades, according to Bureau of Labor Statistics figures. Labor economists and other experts do not directly attribute this decline to any one president’s policy preferences, successes or failures. Rather, they look at trends spanning years or decades, such as more youths seeking higher education instead of going directly to work. Or they look at economic shocks, such as the recession Obama inherited in 2009. The retirement of the baby-boom generation also is an important factor. “The post-recession decline partly reflects the aging of the baby-boom generation, whose members have been reaching typical retirement ages (the oldest of the group turned 65 in 2011). But it also reflects declining participation within some age groups. This overall decline in the labor force participation rate is forecast to continue both during Trump’s term and in the decades that follow, according to economic analysts. McCarthy’s feel-good talking points should steer clear of the labor force participation rate until it truly rises above the level where Obama left it. Even then, it’s important to remember that presidents have only limited powers to move this needle and do not necessarily deserve credit or blame when the situation improves or worsens. 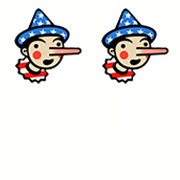 As McCarthy’s spokeswoman says, the rate did go above 62.9 percent for a few months after Trump took office, and there are indeed “more people in the workforce.” However, for giving credit where no credit is due, McCarthy gets Two Pinocchios.